Double L's C2200 Ceiling Air Inlet delivers considerably more cfm than the old C2000. Compare the performance of the C2200 Ceiling Inlet with 2,089 cfm at .125 SP to the old C2000 Inlet with 1,650 cfm at .125 SP. The extra cfm per inlet allows the customer to use fewer inlets per room, resulting in extra savings. 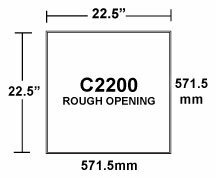 The C2200 Ceiling Inlet operates automatically off of negative pressure supplied by exhaust fan. Counterbalance louvers adjust automatically to static pressure. Each inlet can be shut off for better air control. The Fast Frame consists of a plastic outside frame with a wooden inside frame that provides a clean, professional installation with no exposed lumber. This frame accommodates the C2200, AC3010, GC1140, and TJ4200 inlets.